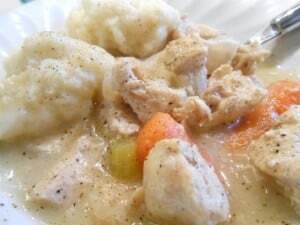 Chicken & Dumplings happens to be one of my husband’s favorite dishes. For some reason, I don’t think to make it very often. 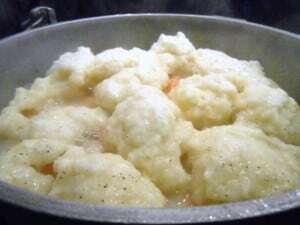 I guess I’ve always thought that it was too time consuming and complicated, especially when making the dumplings. This particular recipe is very simple to make and the epitome of comfort food. 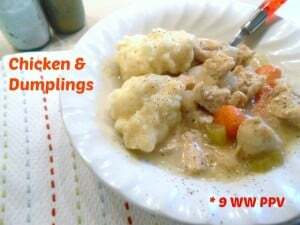 My initial reason for making chicken & dumplings was not only because I hadn’t made it in a while and my husband loves it, but also because we had some thawed out chicken breasts in the refrigerator for a couple of days. 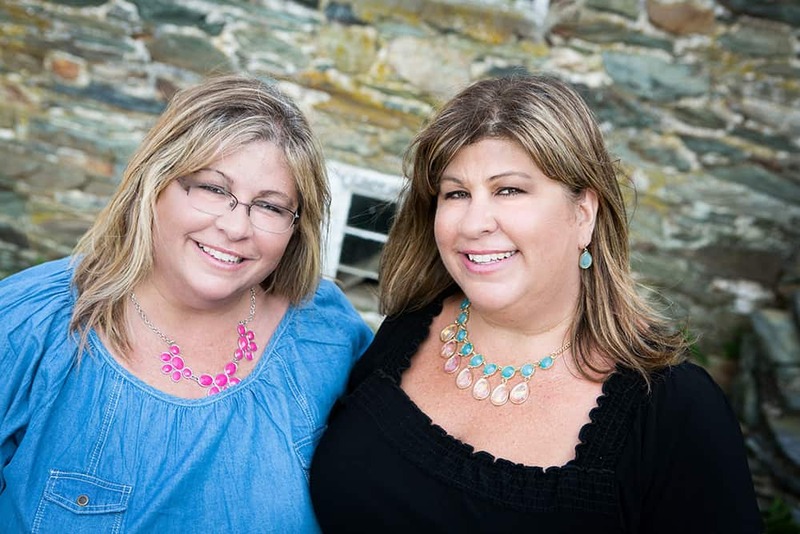 If I didn’t do anything with them on this particular day, I would have had to throw them out. I thought, I could make some sort of soup, or stew……..oh yeah! Chicken & Dumplings! And I happened to have all of the ingredients on hand. I made it and my husband fell in love with me all over again. The way to a man’s heart TRULY is through his stomach! I decided to make this recipe again about a week later because I thought it would be a great dish to bring to a very sick friend whose family is in my prayers and in need of some help with meals. Combine chicken broth, chicken breast cubes, onion, carrots, celery, bay leaf (optional), salt, and pepper in a large pot; bring to a boil. 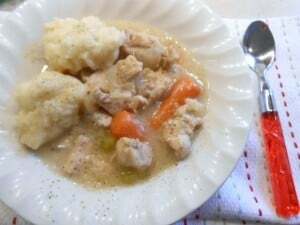 Reduce heat, cover pot, and simmer until chicken is no longer pink in the center and the vegetables are tender, 20 to 25 minutes. Drop the dough by spoonfuls into simmering stew. Cover and simmer 15 minutes without lifting lid. 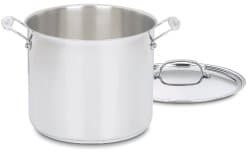 If you’re looking for a good quality stockpot, Cuisinart makes a really nice one. 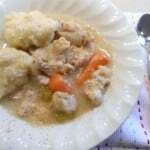 To read in writing that this recipe was very good, totally does it an injustice. You seriously have to try it yourself to really know how good it is. It’s so simple, it’s almost ridiculous, but it creates heaven in a bowl. I couldn’t wait to eat the leftovers the next day for lunch. Another great thing that I realized after calculating the Weight Watchers Points Plus Value, is that each serving totals up to only 9 points. 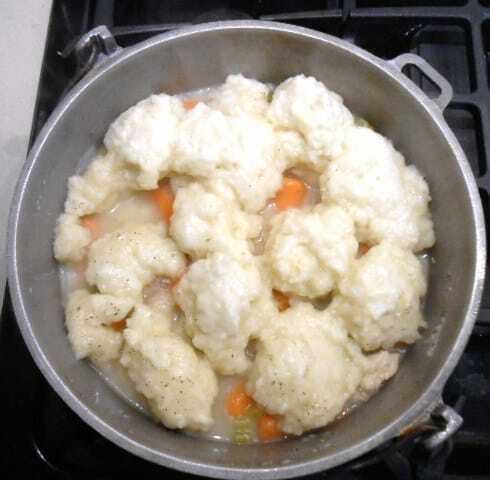 That is pretty darn good for a nice size bowl of Chicken & Dumplings. I just figured that it would be too fattening. But the only fattening part of this dish is the dumplings, which is probably the bulk of the 9 points per serving. An added bonus to making this dish is that it’s relatively inexpensive too. I know, nothing is cheap these days and grocery store prices are skyrocketing, but in the big scheme of things, this meal is so much cheaper to make than other meals you could make. AND, if it makes your husband so happy that he gazes at you adoringly after he eats it, then all the better! You’re funny!!!! Do you think Dad will look at me like Chuck looks at you when I make it????? I will definitely try this one–great for a cold winter night! LOL Cheryl! Probably not, but he’ll be thinking it. I know it says “makes 6 servings,” but what size is the serving size? It looks delicious! Is “T” teaspoon or tablespoon? Is the fact that it’s capitalized meant to indicate Tablespoon? Confusing. Yes, the capital T means tablespoon and the lowercase t means teaspoon. Thanks for asking! Better to be sure. 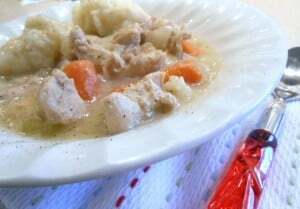 Do you put raw chicken cubes in the broth or should you brown it first? So sorry for the late response. Yes, you put the chicken cubes in raw. The boiling broth will cook the chicken. Just make sure that there is no pink on the inside of the chicken. What total weight should the chicken be? I want make this but want to be sure my points are right. Thanks! It looks so good! Hi Becky, I usually use 1 pound or a little over a pound of chicken. Normally 4 good size boneless, skinless chicken breasts. I would recommend adding more broth too. I just made this recently and I would have liked it better with more broth. Enjoy!